A soldier recounts his relationship with a famous political prisoner attempting to overthrow their country's authoritarian government. Anchorwoman: So many fond memories of Maximilian the First on the tenth anniversary of our glorious leader's death. Anchorman: Many of course doubted that his son and heir, Maximilian II, could live up to the example of his charismatic father. But the man affectionately called Junior has valiantly continued against the pesky rebellion, led by the playwright turned terrorist, John Thorne. I have always had a certain fascination for stories which indict the abuse of power in the name of the state. After I saw this film the first time, I couldn't stop thinking about it. It had all the disturbing characteristics of an Orwellian novel, but it was not as relentlessly depressing. I believe the screenwriter was holding out the hope that the people will "get" the story. In this film, a mythical country is beset by an endless array of despots. These despots show character traits mankind has witnessed in real life, such as Pol Pot, Mussolini, Louis XVI/Marie Antoinette, Peron, Ayatollah Khoumeni, and Kim Jong Il. In this "land of the blind," the people are more interested in popular culture than the suffering of mankind at the hands of the despots. As a result, they elect movie stars to represent them in what becomes clear as a sham system. Those people who are politically motivated and want to see a parallel between the nasty people who are leading the poor nation in the story to ruin and the current world leaders are, in my opinion, completely missing the point. In the first place, the title of this film should provide a clue. 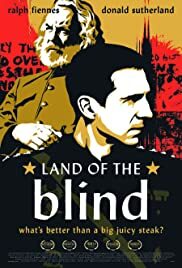 In a "land of the blind," just about anybody could arise to a position of power because the "blind" are too easily led. In this film, there is a heavy reliance on imagery and metaphor. The main repetitive image is that of an elephant. In the movie, the parable of the blind men and the elephant is brought out and that, in my opinion, is what this film is all about. New governments can provide their side of the story--the elephant--to the blind public by steering them to the desired part of the anatomy. 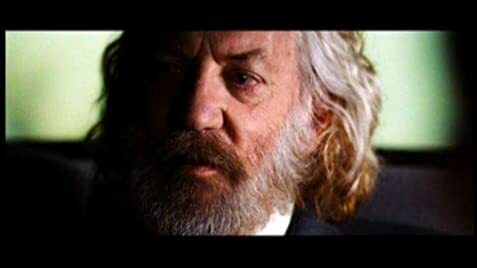 Donald Sutherland, playing a character aptly named Thorn, is one of the best casting choices ever made. You'll need to see this film to understand what I'm talking about. I gave this a nine rating out of ten.